One of the most frightening “what-ifs” of history is the Nazi effort to build a nuclear bomb. Here is a close-up look at that failed attempt. Rose (Modern European History/Penn State Univ. ; Wagner: Race and Resolution, 1992, etc.) 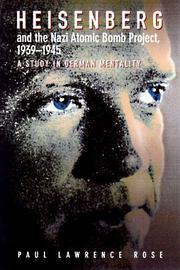 focuses his study on Werner Heisenberg, leader of the German A-bomb project. One of the giants of modern physics, Heisenberg remained in Germany despite his differences with Nazism (he never joined the party and defended “Jewish physics,”i.e., Einstein’s work, when the Nazis denounced it), heading a project that he must have known had the potential to insure German victory. Rose argues that Heisenberg’s actions, including his failure to make a fundamental determination of the mass of uranium required to build a bomb, can be understood only in the context of the moral, cultural, and scientific attitudes of the German scientific establishment. Among these attitudes was a persistent self-delusion, endemic in German culture from the mid-1800s through the end of the Nazi era. Rose begins with a detailed critical analysis of Heisenberg’s account of the bomb project, drawing on contemporary documents and subsequent revelations. The book’s second part examines Heisenberg’s fundamental inability to grasp the principle of an atomic explosive, a failure that ultimately allowed the US Manhattan Project to win the race for the bomb. This failure has been painted by Heisenberg’s apologists as a subterfuge to undercut the project; Rose finds little reason to grant his subject that escape hatch. Finally, Rose examines the moral issues of Heisenberg’s willingness to work with the Nazi regime, and his postwar accounts of that work, which the author terms “historically false and morally corrupt.” While heavily footnoted for the benefit of an academic readership, this meticulously detailed and definitive book should also appeal to any reader intrigued by the moral dimension of scientific work.